We all know what regular cable cars look like. The mountain Stanserhorn in the canton of Nidwalden though, has managed to provide a more revolutionary experience for its guests and at the same time, write cable car history. 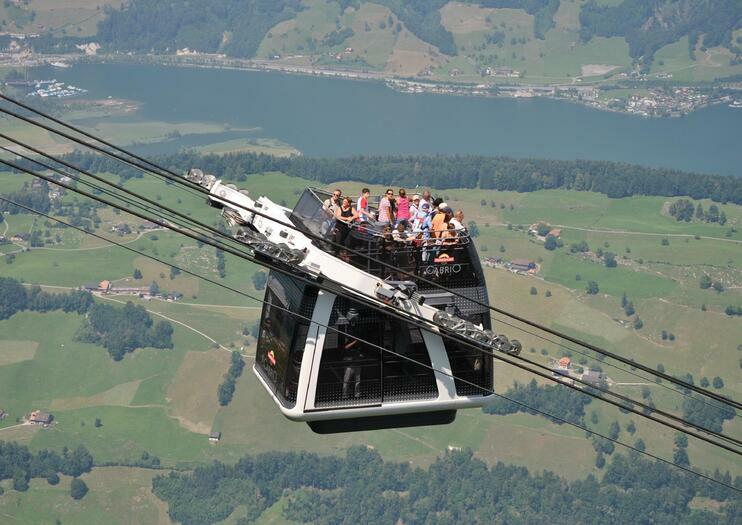 The world’s first convertible-style cable car, the Stanserhorn CabriO, is where the fun is at. You can have a panoramic and completely unobstructed view over a hundred kilometers of alpine peaks while you float under the open sky with pristine mountain air blowing through your fluttering hair. Among other highlights, you can see not only the city of Lucerne in the distance, but also Lucerne’s own Mount Pilatus rising 2,128 meters into the sky, the lower sprawl of the Bürgenstock and the characteristic double peak of the Mythen among a scenery of lakes and mountain meadows. The journey to the 1,900-meter high summit of the Stanserhorn also involves somewhat of a time-jump. Before visitors get to the top-modern cable car with a twist, they ride from Stans to the station in Kälti on a wooden vintage funicular from the 19th century. Fortunately though, the open upper deck holding 30 people is completely optional and passengers can decide whether they want to ride with or without a roof. If the weather doesn’t comply with your plans or if you prefer to have four solid walls, a floor and a roof surrounding you, you can also ride in the lower, fully enclosed cabin. The Stanserhorn CabriO departs from the intermediate station Kälti and is part of a matched up trip involving different transportation methods to take you to the top of the mountain. To get there, take the train to Stans on the southern side of Lake Lucerne, a ride which will take roughly 20 minutes. In Stans, follow the signs to the old funicular, which will then take you to the cable car station. The CabriO operates every 30 minutes between the 11th of April and the 15th of November, with the last ride up the mountain departing around 4:30pm. Ascend to the dizzying summit of Mt Stanserhorn on a full-day coach tour of the Swiss Alps from Zurich. Travel through stunning Swiss countryside to the picturesque city of Lucerne and explore its charming Old Town on a guided tour. Take a traditional funicular railway car in Stans and summon your courage for an open-air gondola ride to the highest point of Mt Stanserhorn. Absorb incredible Alpine panoramas and opt to enjoy a unique dining experience in a rotating restaurant (own expense). If you hold a Swiss travel pass, book this discounted day trip to Jungfraujoch Top of Europe, where mountain vistas and alpine attractions await. After leaving Interlaken Ost train station, travel by mountain train to the summit of Jungfraujoch. Use your time at the top to marvel at the views, visit an ice palace, or even try alpine adventure activities such as husky sledding, at your own expense. Numbers are limited to just nine people for a small-group experience. Discover the beauty of the Swiss Alps on a 5-day self-guided tour through some of Switzerland’s most picturesque cities. Start in Zurich, Geneva, or Basel and visit Interlaken, Jungfrau, Lucerne, and Mount Titlis using the efficient railway system. Enjoy a worry-free excursion with four nights’ accommodation, main activities, railway tickets, and daily breakfast included. Discover the breathtaking landscape of the majestic Swiss Alps. This 8 days / 7 nights independent rail package offers you the convenience of your own schedule while removing the hassles of planning your hotels, queuing for excursions and train tickets.Day 1: Zurich or Geneva to MontreuxOn arrival at Zurich or Geneva or Basel you will make your way to Montreux. Start experiencing the super- efficient Swiss railway network from this very first journey you take.The town of Montreux nestles in a sheltered Lake Geneva bay, surrounded by vineyards and against the breath taking backdrop of snow-covered Alps. Explore the Lake promenade and the Chillon Castle. Montreux is also the perfect base from which you can explore the Geneva region comprising of Lausanne, Montreux and Geneva. Overnight in Montreux Day 2: MontreuxToday you have the day at leisure. You can take a short train trip to Geneva.